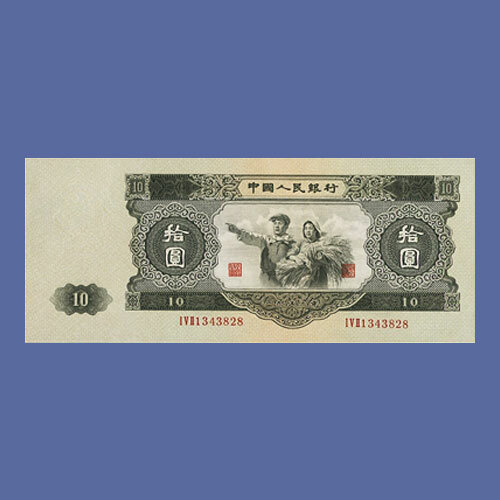 A Famous Gem 1936 Central Bank of China 1 Yuan was sold for $84,000 which is more than six times its pre-auction estimate at the Heritage Hong Kong Auction World Currency. The note features an orange-tinted design and is rare because as many as three organisations namely, Chung Hwa Book Company Limited, De La Rue and Waterlow printed notes for China in those days. A 1953 10 Yuan PMG Choice Uncirculated 64 from the People’s Bank of China was sold for $48,000. A Yuan Dynasty 2 Kuan, 1335-40 Pick UNL S/M#C167-1 was sold for $43,200. It is considered to be one of the earliest examples of paper money from the Yuan Dynasty (1271-1368). Smaller 1 Kuan notes from the Ming Dynasty are more common than this big sized version. The script and design are created on mulberry paper using a charcoal dye. A Hong Kong Hong Kong and Shanghai Banking Corporation $100 1.4.1948 Pick 176e was sold for $33,600, which is almost three time its pre-auction estimate. A Chinese Deutsch-Asiatische Bank Tientsin 20 Taels 1.3.1907 Pick S303s Specimen was also sold for $33,600. A Chinese Banque de l’Indo-Chine 10 Piastres = $10 15.1.1902 Pick S440B was again sold for the same amount. The French bank was unable to meet with the capital base of British Merchant banks, due to which, they are fewer in number. A Japanese Central Bank of Western India Yokuhama $25 9.2.1866 Pick S244a sold for $22,800. The note is cancelled just like all other known examples. The Central Bank of Western India was the first foreign bank in Japan and was also the first one in the country to issue Mexican dollars for foreign trade. A Hong Kong & Shanghai Banking Corporation 1955 $100 Consecutive Pair was sold for $21,600 and a Hong Kong and Shanghai Banking Corporation $100 1.3.1955 Pick 176e Two Consecutive Serial Number Examples was sold for $20,400. Both items were sold for double their pre-auction estimates.